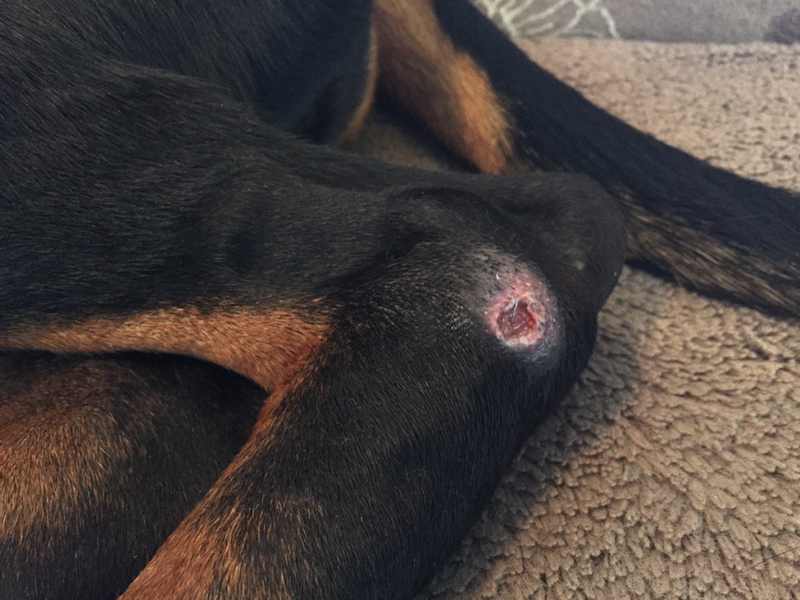 Most of the dogs get pressure sores from laying on hard surfaces. My dobbies get them in summer, when they prefer cooler floor vs warm and soft bed. Overall pressure sores are harmless, but sometimes they get infected. Some warm summer days, my dobbie was licking one sore and made a bubu – it got infected. Filed up with pus and caused his leg to swell up. 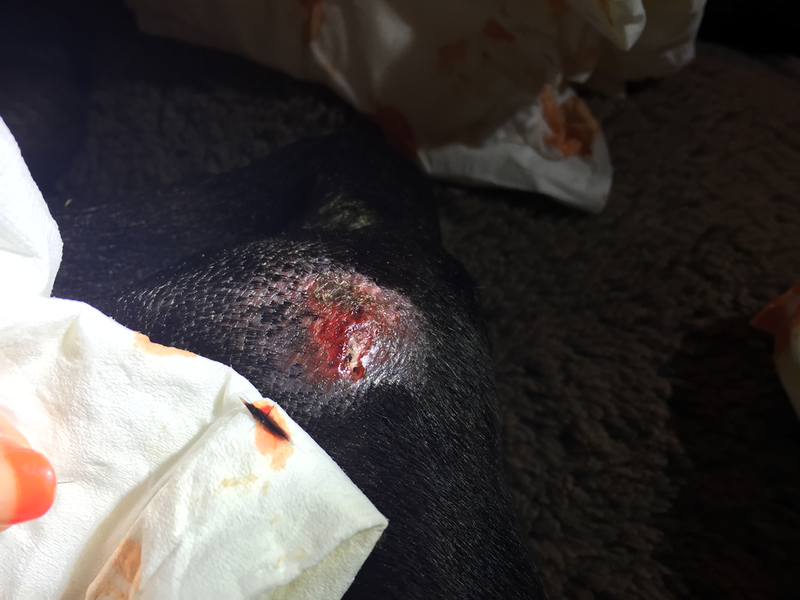 Below are my method of wound care for dogs with pressure sores. Please, note – photos and videos are showing both legs of my dobbie. One leg has an open wound on the pressure sore, another one – no wound. Remove dead hair from inside and around the wound. Ever wondered why a dog’s infected spot on the skin is always baldy? What happens to hair? When infected skin swells up – hair gets trapped under the skin. A natural reaction of the body is to clean the wound by producing pus to push the dead objects (hair) out. So, the first – preventative and cleaning – step is to remove dead hair. In the video below I show how to do that on the pressure sore without an open wound. If the wound is open, you will have to squeeze it like a pimple over and over again until all dead hair is removed from inside the wound. I often use tweezers to pull out hair that got stuck. Make sure to squeeze gently. Dead hair will come out easily. Don’t force it. When all the hair is removed, the wound opening might look larger, but the liquid coming out of it will no longer has yellowish color (no pus). Clean the wound and apply dressing. If pressure sore doesn’t have an open wound – it is best to thoroughly apply antiseptic solution (i.e. iodine or hydrogen peroxide) and let it be. 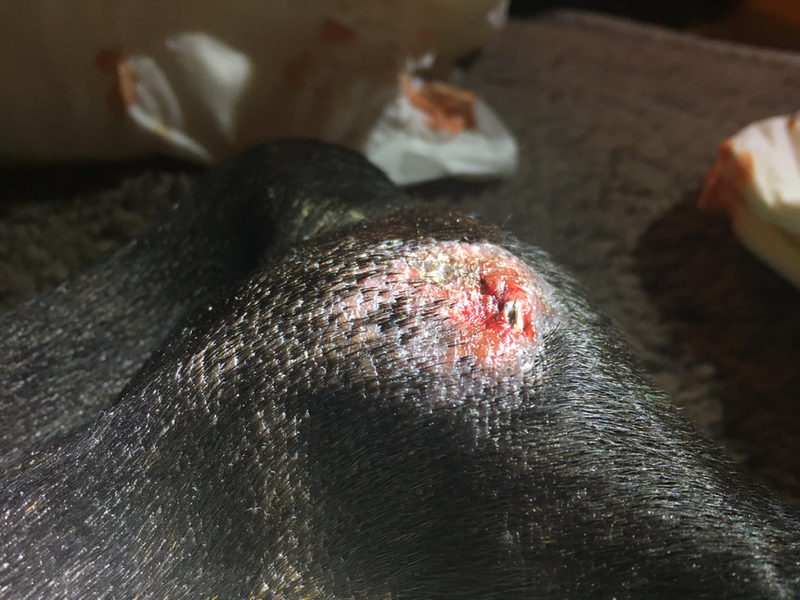 If it is an open wound you have to clean it using gentle antiseptic, such as Veterycin wound and skin care, and apply dressing.